An interval is simply the distance between a note and the note next to it. Intervals are one of the most important “building blocks” in music. Other important "building blocks" are scales and chords. Why do I need to know about intervals? Recognizing intervals makes it easier to learn to read music and to sight read sheet music. Understanding intervals also makes it easier to analyze the music, and to understand the harmony of a piece. And knowing the patterns of the intervals makes it easier even to memorize a piece, or understanding the make-up of a chord. 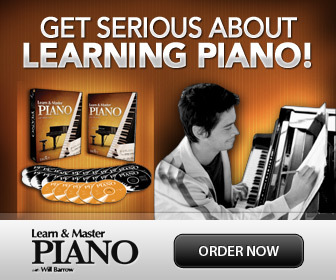 Good news is- learning to master intervals is easy, especially for pianists!!! Take a look at this keyboard. Pick any white key. That key is one (1). The key next to it is 2, and so on. The interval from 1 to 2 is called….. A second!! Choose another. F for example- from F to A is the interval of 1-2-3...a third!! Yes! The white keys on a piano keyboard represent the basic 7 notes in the music alphabet; A,B,C,D,E,F,G. From one white key to another you will find all the different basic music intervals. The basic intervals are: unisons, seconds, thirds, fourths, fifths, sixths, sevenths and octaves. Larger intervals are called compound intervals, since they can be seen as an octave plus a second = a ninth; an octave plus a third = a tenth, and so on. Tenth: From 1 to 10, etc. This is all very easy, and you can quickly learn this as you play the piano. Practice playing and saying the interval names out loud. Tip: Observe how the odd numbered intervals; thirds, fifths and sevenths have an “even look”; space-space notes, or line-line notes. Whereas the even numbered intervals; seconds, fourths, sixths and octaves, have an “odd look”; line-space notes or space-line notes. This little distinction makes them easier to recognize without counting! Too easy, huh? Ready for a bit of a challenge? OK! Not all intervals are the same. That is, they don't come only in different sizes, but in different "qualities" as well. Unison, fourths, fifths and octaves are either perfect*, augmented or diminished. Seconds, thirds, sixths and sevenths are called either major (big)or minor (small). When using sharps or flats, they can also become augmented (extra big! ), or diminished (extra small). *The word “perfect” has to do with an old way of tuning. The unison and octave is basically the same notes, just higher/lower in the octave. So they have to be tuned “perfect”. Divide the octave in half, and you get one fourth and one fifth. These intervals would also be tuned “perfect” and without distortion or dissonance as in the old “Pythagorean” tuning method. All the Fourths on the white keys on the piano keyboard (or notes without sharps or flats) are ALL perfect, EXCEPT between F and B. The Fourth between F and B is "bigger" than normal, it is augmented. This interval that is 3 whole steps is also called a Tritone. All the fifths on the white keys are perfect, EXCEPT the fifth between B and F, which is smaller than the others, it is diminished. This fifth is also 3 whole steps, and is also called a "Tritone". It sounds the same as the augmented fourth, since it is actually the same interval between the tones! Seconds are intervals that we also call steps; either whole steps (tones) or half steps (semi tones). On the piano keyboard it is easy to see that most white keys next to each other (step) have a black key in between them, except from between E-F and B-C. Whole steps have a black key in between, (or two black keys with a white in between) and half steps are the smallest step from one key to the very next, black or white. Whole steps are called Major Seconds. Half steps are called Minor Seconds. Thirds can also be one and a half step, which is called a Minor Third ( and gives the “sad” sound in a chord or a scale). Sixths are simple to figure out if they are major or minor, just by “flipping over” or inverting to a third! In this example the C is moved an octave lower. If the third is major, the "inverted" sixth is the opposite; minor. This works the same with sevenths; flip over (invert)a minor seventh, and you get a major second, and the other way around. Still easy? Ready for some more? We can make these “natural” (no sharps or flats) music intervals even bigger or smaller by using sharps and flats! So, a second, third, sixth and seventh can become: minor, major, augmented or diminished, but never perfect. A unison, octave, fourth and fifth can become: perfect, augmented, diminished (or double-), but never major or minor. The shapes and patterns of the music intervals are easy to learn to recognize. Practice the intervals on the piano as you say the interval names out loud. Fourth: Perfect, except between F and B (augmented). Fifth: Perfect, except between B and F (diminished). By adding accidentals (sharps and flats) you can change the size of an interval. For example; perfect becomes augmented when making it larger, or diminished when making it smaller.